From 3 to 5 June 2015, the 25th edition of the World Economic Forum on Africa 2015 took place in Cape Town, South Africa. It was the first time that Somaliland participated in the conference, represented by Foreign Minister Mr Behi. Participation in this event, believed by the organisers to be the largest ever held in Africa, provides Somaliland with the opportunity to raise awareness of the current situation in the country. The Republic of Somaliland is at the 25th World Economic Forum on Africa 2015. Representing the country is foreign minister Mohamed Behi Younis who accompanied by special assistant Ms Nimo Elemi is among over 1000 leaders from business, politics and civil society attending the three-day conference which ends Friday. Themed "Then and Now: Reimagining Africa's Future." 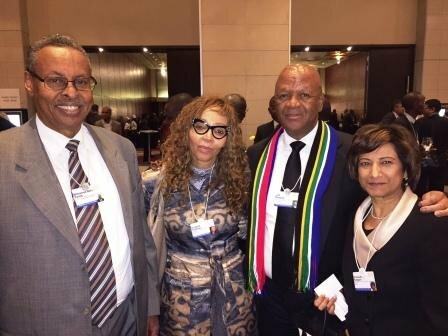 The 25th edition of the World economic Forum on Africa held from 3rd to 5th June in Cape Town South Africa is the first for Somaliland to attend in an official capacity. FM Behi who arrived in Cape Town a day prior to forum start was received at the airport by a committee of Somaliland citizens in South Africa led by Chairman Keyse Mursal Mohamed. Organizers say the meeting is the largest ever to be held on the African continent and the record levels of participation are believed to reflect optimism in the economic prospects of the region. There is an "unprecedented commitment across all stakeholder groups to pursue public-private cooperation as a means of tackling the considerable challenges the region still faces," organizers said. "The occasion of our 25th meeting allows us an opportunity to see how far Africa has come economically, socially and politically since 1990," Elsie Kanza, head of Africa, World Economic Forum said in a statement.